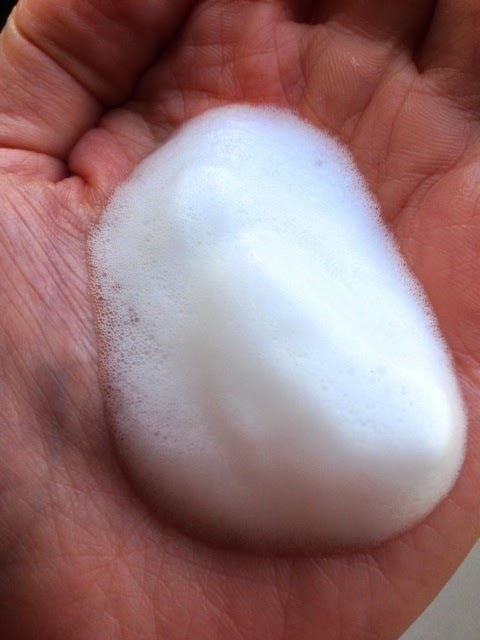 Hey folks, this Friday I'm reviewing the Bliss Triple Oxygen Instant Energizing Cleansing Foam. Long story short, I have mixed feelings about this one, depending on the moon phase and which way the wind is blowing (or more accurately, what state my skin is in that day). Oxygen spa treatments seem to be featuring lately in the lives of the rich and famous, particularly oxygen facials. This confuses me somewhat as I had always thought that the effects of oxygen on the skin were largely negative, and that's why we used antioxidant creams and whatnot. But I'm no expert so I could be talking through my you-know-what. This cleanser provides a triple hit of oxygen to your skin along with a dose of Vitamin C (an antioxidant?). It claims to remove make up and impurities while hydrating and energising your skin. First things first, I like the packaging with its clean, no-frills pump action bottle. I like that it's transparent and you can see the liquid inside. I like that the bottle pumps the liquid out as a frothy foam out into your hand. Ok, I really like that (bubbles!!!) But then the next thing that strikes me is something I most certainly don't like. The smell. It's pretty strong. My immediate thought was that it must contain tea tree oil and grapefruit (it doesn't) because it has a kind of citrusy anti-bacterial type smell. Because of the smell I was worried about using it around my eyes (it smells stingy and I hadn't even looked at the ingredients yet) but I gave it a go, in the name of research, with no ill effects. In fact it cleans really well, it's the facial cleanser equivalent of using orange oil solvent for household cleaning, it just cuts straight through grease and grime. It even removes my waterproof mascara which is usually really awkward to shift. You pump this three times into your hand and massage it into your damp skin. The foam seems to act as a skin buffer, I really feel like my skin is being polished when I massage it in; it's a pretty intense clean. Big thumbs up there. My main concern is how tight my skin feels afterwards, and that's not even on a particularly dry-skin day (it's supposed to be hydrating?) My skin only feels balanced afterwards if I use it on a day that my skin is really oily, but for me that's only a couple of days a month. I would recommend this foaming cleanser to anyone with very oily skin or acne, I imagine that it would work a treat for sebum control. For me personally, I think this is a little too drying on my combination skin, which is very disappointing because I love the deep clean it gives. If it retailed at a more acceptable price I would probably repurchase and just step up my moisturiser, but at €30 or thereabouts for 150ml (though to be fair it does go a long way) I can't bring myself to shell out. Also I think that adding stuff like oxygen and vitamin C to a foaming cleanser is a bit of a gimmicky marketing ploy. Fair enough if it's in a moisturiser and can sink into your skin to do its thing but a cleanser doesn't have enough time to impart those kind of benefits before you rinse it off. Check out the Bliss website here for more information if you're interested. I will certainly be on the hunt for an alternative, I'm pretty sure they're out there. If I can't find one, mayyyybe I might repurchase, maybe, no I won't. But maybe. But for now I'll say no. I think. Yes. Definitely. No. Or... Decisions, decisions. Until next time, please comment with any suggestions you may have for foaming cleansers that I could try (hydrating, deep-cleaning and non-stinky puh-lease! ), I would be eternally grateful.